The Samsung Galaxy S is one of the more unique handsets Stateside simply because it comes in many variants and is known by different monikers, depending on the mobile carrier which you purchased it from. T-Mobile’s edition is known as the Samsung Vibrant, where this multimedia intensive smartphone is more than capable of combining the whole range of entertainment and communication needs in a single device. For the layman, it could very well be your mobile TV, bookshelf, radio, movie library, gaming system and smartphone all rolled into one. Some of the exclusive entertainment features include the Avatar movie on an included 2GB microSD memory card, as well as an exclusive collector’s edition of a popular game. Not only that, you can continue reading your eBooks thanks to the Amazon Kindle for Android application that opens up the doors to over 600,000 books, MobiTV with live and on-demand TV, and much more. 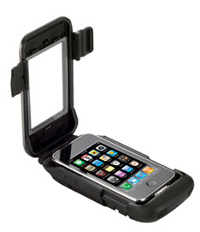 Magellan GPS has just rolled out its latest rugged protective case known as the ToughCase, where it will offer both the iPhone as well as iPod touch full waterproof capabilities – just make sure you have a decent pair of waterproof headphones to go along with it! Targeting outdoor enthusiasts and outdoor professionals, this new ToughCase will not be limited in its release to selected regions only, and what makes it all the more special would be the integration of GPS navigation capability, further enhancing the accuracy of location-based and GPS applications for both the iPhone 3G and iPod touch, all the while offering protection as well as providing unmatched accessibility to all iPhone and iPod touch features. Hopefully you’ve had the pleasure of paper folding with origami, and you might want to check out this project from Harvard’s Robert Wood and team. Wood has somehow managed to put tiny actuators onto pieces of origami paper, which will allow it to fold itself into many shapes. I have included a video of it after the jump so you can see it miraculously fold into a boat or a plane. Imagine being out near the edge of the ocean, and you suddenly encounter a Portuguese man of war. It’s stinging tentacles paralyze the whole right side of your body, and you are unable to swim. Suddenly, you see this red thing approaching you. Don’t worry, it isn’t a shark, but Emily, the Emergency Integrate Lifesaving Lanyard. You could call Emily your own personal lifeguard robot. Just think of it as a combination of David Haselhoff’s finest television shows: Baywatch and Knight Rider. Emily is made to be tossed into troublesome waters from the beach, from a ship, or even from the air. It then swims away by remote control to rescue swimmers in peril at speeds of 28 miles per hour, and it has a battery life capable of 80 miles on a single charge. It even has speakers for two-way communication with a real lifeguard. Nothing I love more than seeing the dream of the flying car come to pass, and I have just seen part of that happen today. The last time we covered the Terrafugia Transition, the company had said that they wanted them out by the end of 2009. Well, 2009 has come and gone, and there are currently no signs of flying cars cluttering our skies. However, the FAA has just approved the Terrafugia Transition for flight time. If you have $194,000, you can fly this car with fold out wings. This next article isn’t really about a cool gadget per se, but it definitely inspired me to tell all our readers how to really improve science and technology. Hear me out on this one. A Massachusetts high school science teacher recently put his three best students on a special assignment. They were told to imagine a world where some sort of spacecraft was hurtling toward Earth, and that it was up to them to figure out how they would record the event while onboard a separate aircraft. The three students eventually put their heads together and came up with a way of doing what the teacher said. Then, the plot twist occurs, and the teacher is revealed to be a representative from NASA. He then took the students to Japan, and they implemented their solution to the problem. They even got to board a DC-8 and actually took photos of the Hayabusa spacecraft. I’m not really into Fallout 3, but the popular video game begins with the idea of starting in a “sheltertown” before journeying into the wasteland. Complexes will be deep underground, airtight, fully self-contained shelters designed to survive virtually any catastrophe, or threat scenario including natural disasters, a nuclear blast, chemical and biological weapons, or even social anarchy. As a professional blogger, I don’t really have an office per se. In fact, all I really need to do my job are three things: a laptop, an electrical outlet, and a stable Wi-Fi hotspot. However, I used to work for “the man”, and there is one thing that I know about corporations: never have permanent office space. Perhaps you work in an office where there is this unnecessary shuffling of cubicles, and I’m sure you are having a hard time seeing the big picture. I would suggest that you simply make your office spaces more portable with these portable offices. As you can see, all your office equipment such as chairs, desk, shelves, etc. can all be put on this one thing, and then moved with the simplicity of a wheelbarrow. After the jump is a picture of what it all looks like when it is placed.